Cloud B Sleep Sheep Discounts Apply ! Sleep Sheep will help both you and your baby relax as you listen to the quiet stream, spring showers, swooshing ocean waves and harmonious whale sounds. 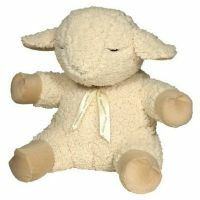 Invented by two moms, the Sleep Sheep acts as an audio pacifier that helps take some of the stress and crankiness out of nap and bedtime. 4 Soothing Sounds: Mother's Heartbeat, Spring Showers, Ocean Surf, and Whale Songs. Velcro tab to secure Sleep Sheep to the outside of a crib. Removable sound box with adjustable volume and on/off controls. Automatic time-out after 23 minutes.